The main limitations of standard nadir-pointing radar altimeters have been understood for a long time. They include the lack of coverage (intertrack distance of typically 150 km for the T/P / Jason tandem) and the spatial resolution (typically 2 km for T/P and Jason), expected to be a limiting factor for the determination of mesoscale phenomena in the deep ocean. In this context, various solutions using off-nadir radar interferometry have been proposed by have been proposed by Rodriguez et al. 2004, to provide a solution for oceanographic mission objectives. 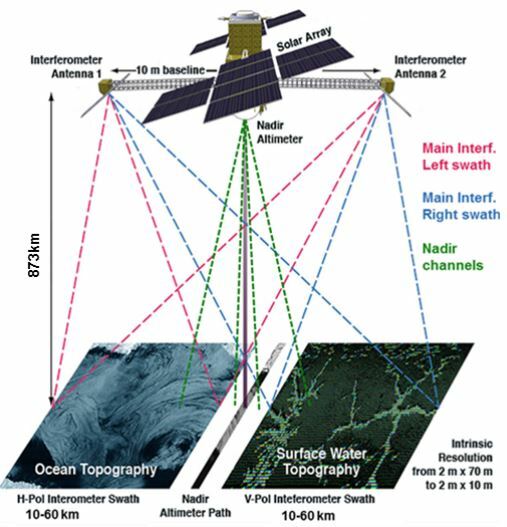 An initial approach is based on the Wide-Swath Ocean Altimeter (WSOA) which was intended to be implemented onboard Jason-2 in 2004 but has now been abandoned. An altimeter/interferometer would work as follows: each interferometer would send out and receive back a wave from the others. fig 2. How the WSOA altimeter/interferometer works. Measurement noise, which depends on the antenna baseline: the longer the baseline, the less noise there is. This noise is reduced by mosaicking. The nadir-pointing altimeter also makes it possible to register pixels. The error related to ionospheric, tropospheric and sea-state bias effects. Here again, the radiometer’s wide antenna lobe will enable tropospheric corrections to be extended reliably across a good proportion of the swath. ” The error induced by satellite roll and pitch, which has a direct impact on measurement geometry, by triangulation. This noise could be minimised by analysing and adjusting ascending and descending data at crossover points. Final measurement accuracy could be as good as 3.2 cm rms per pixel in the mosaicked data (averaged to 15 km cells). fig 3. Example of WSOA measurements along a T/P-Jason-class orbit track. This mosaic offers a huge advantage in terms of describing the dynamic topography at high resolution, since it allows us to measure sea surface gradient (between pixels) and, therefore, geostrophic velocity. Simulations based on realistic model data yield an error of 4.7 cm/s rms (resp. 5.9) on the zonal velocity (resp. meridional velocity). Sampling simulations (based on a T/P-type orbit, since WSOA could be flown on the Jason satellite) show that the WSOA concept would require a constellation of four conventional nadir-pointing satellites in a repeating orbit. The instantaneous field of view would be wider than with a conventional altimeter, making it possible to cover coastal zones and to improve temporal resolution. The major drawback of such a system is that it involves intensive processing to improve accuracy. 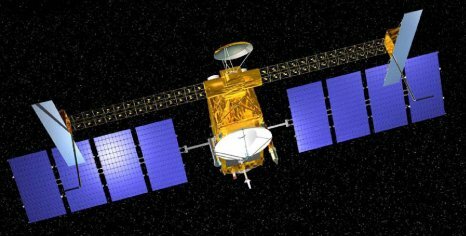 The WSOA option for ocean monitoring was dropped from the Jason-2/OSTM spacecraft in the spring of 2005 because of concerns about programmatic risk to the core Jason-2/OSTM mission and due to cost overruns. 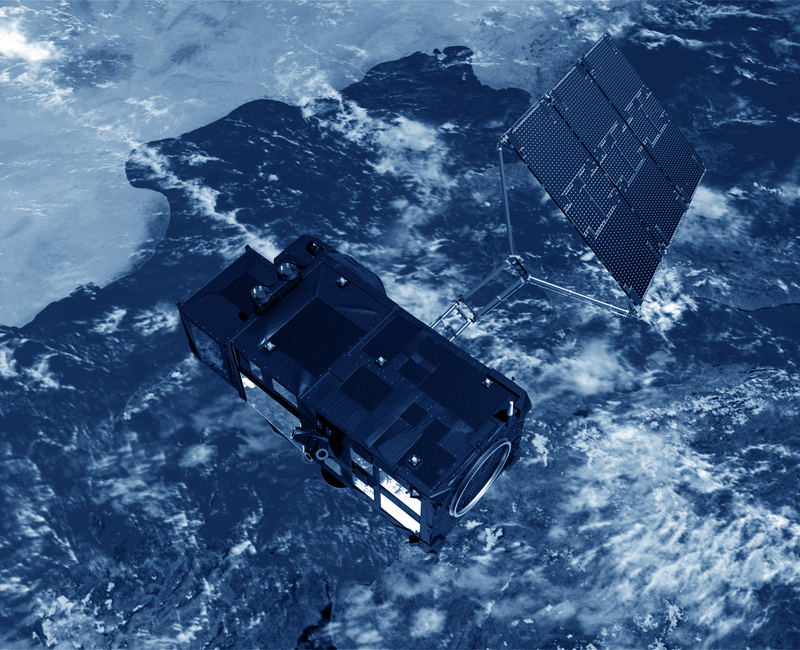 It evolved in the SWOT KaRIn instrument to provide high-resolution measurements of SSH (Sea Surface Height) on approximately a 10 km grid across a 200 km swath centered on the satellite ground track. fig 4. SWOT integrated measurement approach (NASA, CNES). SWOT utilizes an integrated measurement approach, which includes the KaRIn system to observe in two off-nadir swaths, each of 50 km. KaRIn produces ocean and surface water heights and -co-registered weather imagery and elevations of 50 m and 1 km resolutions for hydrology and ocean communities, respectively. KaRIn includes an experimental nadir channel, either as a NNI (Near-Nadir Interferometer), or as a KNA (Ka-band Nadir Altimeter). The NNI is baselined. Both provide complimentary measurements to KaRIn and to support calibration and validation. The CNES-supplied Jason-heritage nadir altimeter specifically addresses SSH for long spatial wavelengths. The Jason-heritage microwave radiometer corrects the nadir altimeter range measurements for the wet tropospheric delay and the GPS and DORIS receivers, with the LRA (Laser Retroreflector Assembly), provide precision orbit determination. Enjolras, V., P. Vincent, J.-C. Souyris, E. Rodriguez, L. Phalippou and A. Cazenave, Performances Study of Interferometric Radar Altimeters: from the Instrument to the Global Mission Definition, Sensors, 6, 164-192, 2006.